A few months back, I promised to post a comprehensive series on different skin types and how to care for them. If you haven't seen that post yet, read it here to find out how caring for your skin with the correct skincare can really transform your skin completely. I decided that it was really important that I start with oily skin, because this is where most misconceptions arise, and oily skinned people are the ones who are the most misinformed about how to best care for their skin type. The first thing you must know about oily skin is that people with oily skin do not have overly hydrated skin - in fact it is the exact opposite. The reason why the skin overproduces oil or sebum in the skin, is that the skin lacks hydration, and it is trying to make up for that deficit by producing extra oil. Unfortunately, this does not solve the situation, because then the skin becomes too oily, pores become clogged, makeup melts off the face, and the counter measures taken to get rid of the oil on the skin only serve to aggravate the situation. 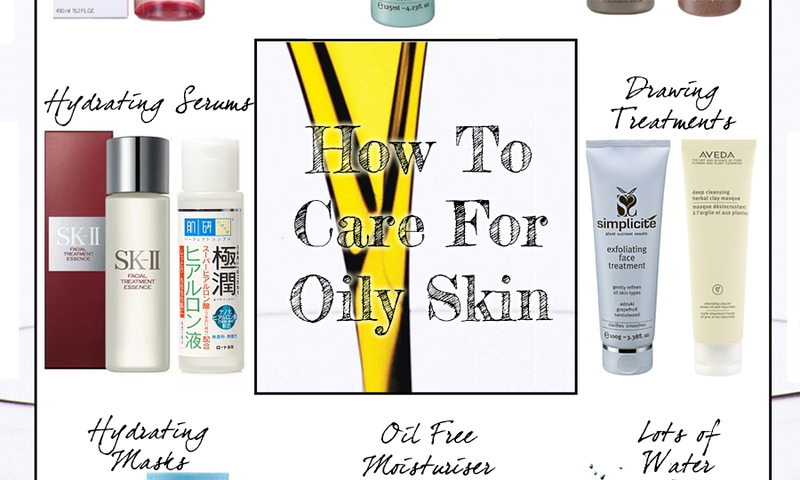 So how do you care for oily skin? The answer is actually quite simple - hydrate the skin. Starting with your cleansers - I believe that your first step each night should be an oil cleanser, just because I feel it's the best way to rid your skin of impurities, dirt, and makeup. I love Shu Uemura's Porefinist Anti-Shine Fresh Cleansing Oil because it is designed to help clean out your pores and regulate your sebum production. I personally find that it's been helping to keep my blackheads at bay, along with the help of the other skincare products mentioned in this post. You should always follow up your cleansing oil with a regular cleanser, especially if you're oily-skinned. A huge mistake that oily-skinned people make, is to instinctively reach for the harshest, most foamy cleanser there is, because they want to scrub and strip all the oil from their skin. Unfortunately, all this does is to tell the skin that it needs to produce even more oil, and that's what it does. And the vicious cycle continues and keeps clogging your pores as it goes on. Step out of this cycle by choosing instead a gel/cream hybrid cleanser - this gives you moisture whilst at the same time cleaning out the grime and dirt from your pores effectively. I love the Simplicité Plant Gel Cleanser because it is so soothing and smells amazing, but still does its job effectively. Oily skin = clogged pores, so you are definitely going to have to exfoliate your skin. If anti-ageing has not yet become a part of your routine, then you'll want to use the Simplicité One Step Exfoliating Cleanser. This is absolute magic and has helped me clear up my skin tremendously! If you're also going for more anti-ageing treatments, then the Alpha-H Liquid Gold will help you kill two birds with one stone. Remember though, that you will also need to schedule extraction facials at least once a month, to help remove blackheads that have formed and to cleanse your skin. You should always make time at least once a week to slap on a couple of masks. A deep cleansing mask will really help you to continually 'draw' impurities from the skin, and help to prevent clogging and blackheads. A hyrating mask will help keep your skin moisturised, and keep the oiliness away. Some deep cleansing masks I absolutely love are the Simplicité Exfoliating Face Treatment (this works as both an exfoliant and a 'drawing' mask, and really helps keep your skin in check), and the Aveda Deep Cleansing Herbal Clay mask (a mask that really draws the impurities in your skin to the surface! Slap this on about a week before a big day to draw everything out and treat it with your blemish gel for clearer skin on the big day). It's very, very important to hydrate oily skin, and you can do this in a number of ways. As mentioned above, you can apply a hydrating mask once a week (or more) to give your skin a moisture boost. I love the Clarins Hydraquench Cream Mask and the Nuxe Creme Fraiche - both gentle, lightweight masks that are great to carry around with you, and I even apply them on long flights since they're almost colourless. Also, never ever skip the moisturiser! I know a lot of people think that since they have oily skin, they can skip moisturiser. This makes things worse for your skin. What you can do instead is to look for an oil-free moisturiser specifically targeted at oily skins. I love the Simplicité Oil-Controlled Day Cream, because it really does moisturise my skin and keep the oil at bay at the same time. Finally, remember to always, always drink lots and lots of water! Water is essential to the body, and your skin needs it to flush toxins away and keep plump and moist. Always carry a water bottle around with you and remember to take a few sips every once in a while. Also, drink a glass full of water right after you wake up in the morning for extra effectiveness. If you have any tips for oily-skinned girls, leave them in the comment box below!